Magnet advertising is one of the most preferred alternate traditional marketing strategies because it helps to stick business messages at various ferrous places indoors and outdoors. 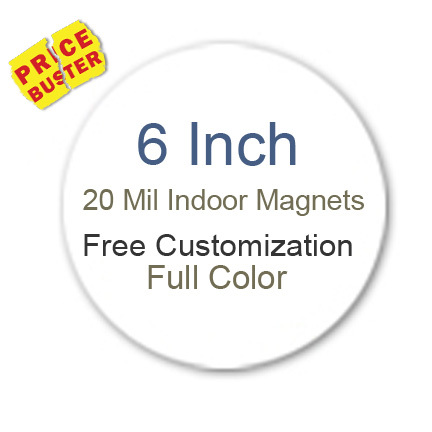 6-inch circle magnets are one of the most engaged promotional magnets for indoor and outdoor advertising. No matter, whether you are a newbie or an experienced marketer reading this blog on creating impressive advertisements over 6 inch magnets, we’re sure that these points will help you in long- term. Before writing a creative advertisement, you need to self -examine, what all emotions stir your consciousness. What are the emotions that come to your mind on hearing words such as teary, happy, stinky, and stale? Perhaps you end up grasping the associated emotions right?! Similarly, you should try to arouse emotions within customers who are seeing your advertisement. Carefully select the words, which best describe the emotions of your products and services. For example- if you are selling pizzas, try to make it sound such that a viewer is encouraged to order it from you the every time, they see this advertisement. Are you suffering from thin hair? Do you wish to earn crop of fine hair? Although the first sentence directly addresses the problem, it will make people realize that they are lacking something. However, the second sentence helps people to improve their confidence and keep trying for a crop of hair, which is fine and healthy. Adapt a tone of encouragement, rather than discouragement and disappointment, while working over 6 inch circle magnets or any other promotional magnet. Nowadays, you might see people using enhanced technologies to filter out television commercials. Do you know why they do so? They are doing it because they find such advertisements boring. For example – Over the years, you might have seen how deodorant manufacturers are competing with each other to sell the product, which sounded more like aphrodisiacs than a cosmetics. Many market players and industry experts suggest that deodorant industry lost their costing power because people were reluctant to buy a product, which gave them no specific benefits. Today, many deodorant marketers have regained their industry position by creating advertisements, which suggested that their product is newly improved offering maximum sprays at the cost they are paying or their product is gas –free, etc. In short, you should try to create an advertisement over 6 inch circle magnets such that they meet expectations of people. Remember that you are not competing in an essay competition in the school or college, rather you are writing a marketing text to attract customers. Limit use of adjectives and adverbs to the minimum, try to frame sentences, which sound real. Avoiding use of adjectives and adverbs doesn’t mean that you should create bland sounding text, rather it should sound genuine, yet appealing. You can emphasize on metaphors to present your advertising on a lighter, yet higher note. The key to a perfect and successful advertisement is striking balance between sensory, emotional, and genuine sounding words. Circle magnets 6 inches offer you large space for positioning your business information in a creative way. Additionally, you can save on online design proof, art setup, full color printing and shipping by ordering these customized magnets from any reputed e-commerce store stocking them.